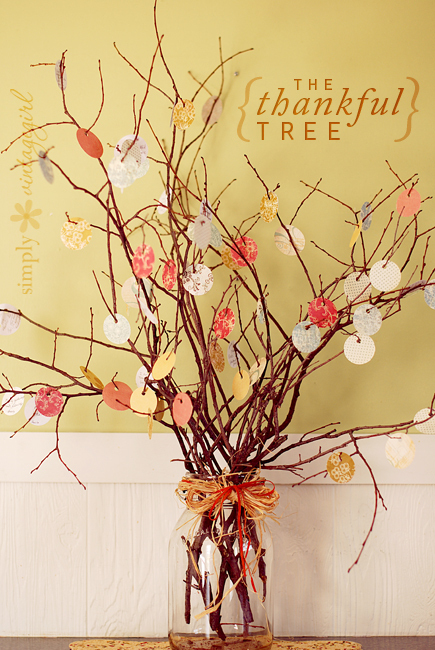 grandma's cookie jar: crafting with grandma - the Thankfulness Tree! There are many things I hope to pass on to my grandsons, but one of the most important is the commitment to having a thankful heart. I'm trying to be focused on sharing with them the things I'm thankful for - big and small. Yesterday, when Josiah and I were in the car, we were talking about the sun. Josiah was quite focused on how hot it is and how if we touched it we would be burned up! Unless, that is, we were in a rocket which had an outside which was "impervious" (his choice of word) to the heat! I laughed and told him I was so thankful the sun was right where God put it so we could have light and warmth and not be burned up or too cold. Then I thanked God for putting the sun exactly where He put it! I want the boys to learn to be thankful and to express their thankfulness to God! So, when I saw a craft on Pinterest for a Thankfulness Tree, well I had to share it with you and make plans to make one with the boys as well! Follow this link and you'll find the idea behind the Thankfulness Tree. Then plan a nature walk with your grandchildren where you can pick up a few branches to make your own Thankfulness Tree, find a jar to put them in, make a label for the jar and tags for the tree. From there, take some time to write - or draw - things on the tags for which you are thankful and hang them on the tree! You could leave a pen and blank tags by your tree so anyone who visits can add what they are thankful for and to make it easier to add to the tree as you think about being thankful all the way to Thanksgiving Day - and beyond! Thank how special it will be to remove the tags on Thanksgiving and go over each one with your family and spend time together being thankful for God's many blessings - big and small!